We all want that extra boost when we are looking to get results fast. And as I am sure you have heard before, “every little bit counts.” With that said, why not take an extra 2.1 seconds and sprinkle some of the spices below on your foods? It may not be the difference between going from 10% bodyfat to 7% (as we all know this comes from nutrition and exercise), but they definitely can’t hurt. Cinnamon will help your body process the carbs that you eat more efficiently, meaning they won’t have as great of impact on your blood sugar levels. Plus cinnamon has a laundry list of benefits which you can see here! Using cayenne pepper gives the body a natural thermogenic boost, which means it naturally boosts your metabolism. Plus it contains tons of great antioxidants. And did you know, cayenne is commonly used in many fat burner supplements? Crazy right? Cardamom is another metabolism boosting spice which means it can help you burn fat. It is great for digestion and helping with an upset stomach! Cardamon is also known for it’s ability to increase circulation and improve energy. Perfect to add to a cup of tea! Ginger is a spice that has an incredible thermogenic response and one that greatly helps in digestion. It is packed with antioxidants and will help boost energy and eliminate muscle soreness. Cumin once again gives the body a natural thermogenic boost to help keep your metabolism high. It also gives the body an immune boost and will help with digestion. Perfect for adding to meat and vegetables. As was stated before, just adding these spices won’t take you from 10% body fat to 7%, but they can certainly help in playing a small role in that. With all the great benefits these spices bring, it can’t hurt to start adding them to meals. 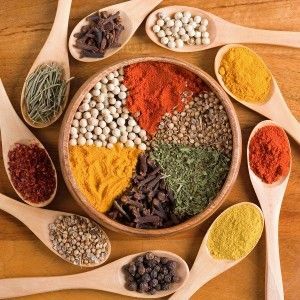 What are some of your favorite spices to use while cooking? I’d love to hear from you! P.S. Find this article helpful? If so, be friendly and share with friends!